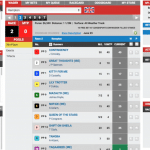 Interbets.com is a US-licensed horse racing betting site operated by the Catskill Off-Track Betting Corporation, which itself is a public benefit corporation originally created by New York State in 1976. Interbets is a New York-based horse betting site licensed in the USA and run by the Catskill Off-Track Betting Corporation. 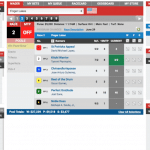 This site caters primarily to horseplayers from the state of New York, but does accept customer from other states as well and covers races across North America. Unlike many of the racing betting sites we review around here, Interbets is not a private company looking to turn a profit. 100% of all profits earned by Interbets are diverted to the horse racing and breeding industries in addition to state and local governments in New York. Although Interbets.com is primarily intended for residents of New York, it does accept customers from some other states in which online horse wagering is legal. 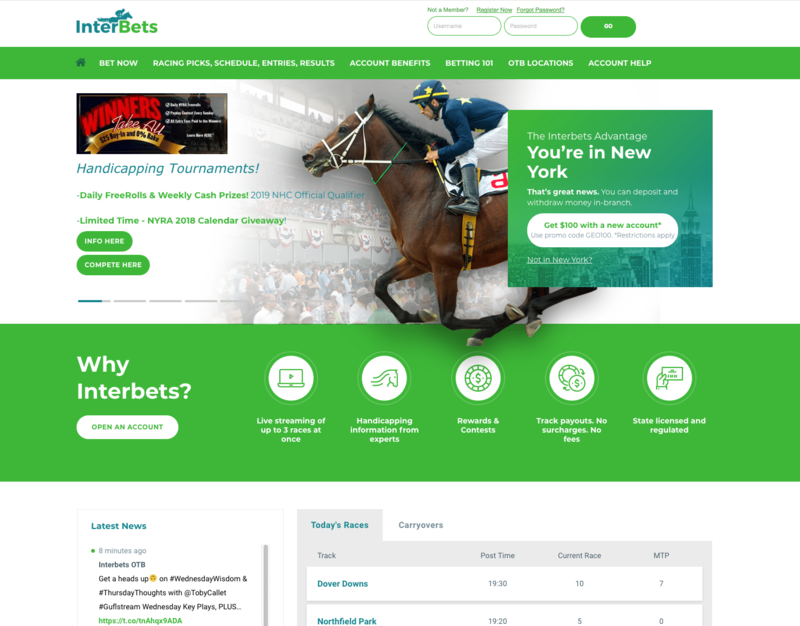 You can see evidence of this emphasis in certain features such as the ability to wager at OTB locations in-person using your Interbets account, but overall this site functions just as well for out-of-staters as it does for New Yorkers. Speaking of which, New Yorkers will be glad to know Interbets online wagers are exempt from the NYS surcharge. You can also request a “no surcharge” account to have that benefit applied to wagers placed via phone or at OTB locations. Interbets recently revamped its betting interface to greatly improve the experience of actually placing bets online. 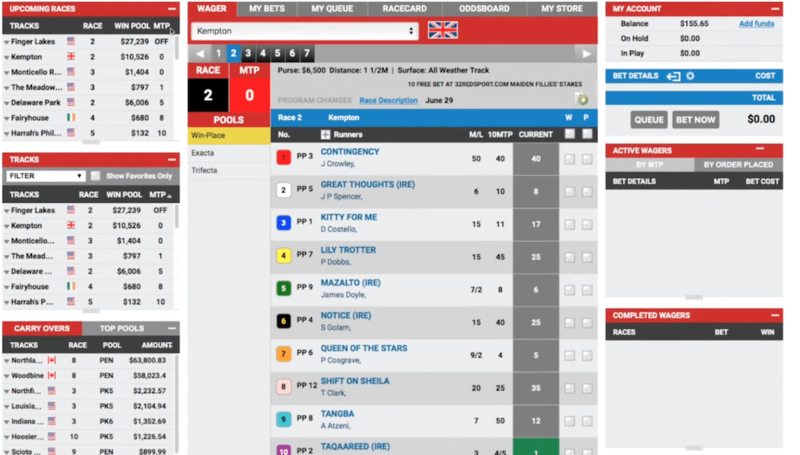 The new interface is based on a clean, minimal style that makes it easy to find the tracks you want and then bet on races at full track odds. Once you have an account, you can use two widgets on the left side of the screen to view upcoming races or to browse a full list of tracks. You may also add individual tracks to your favorites list and save that for quick-viewing any time. They also have handy filters that you can use to view the top pools and carryovers to see where the most betting money is today. 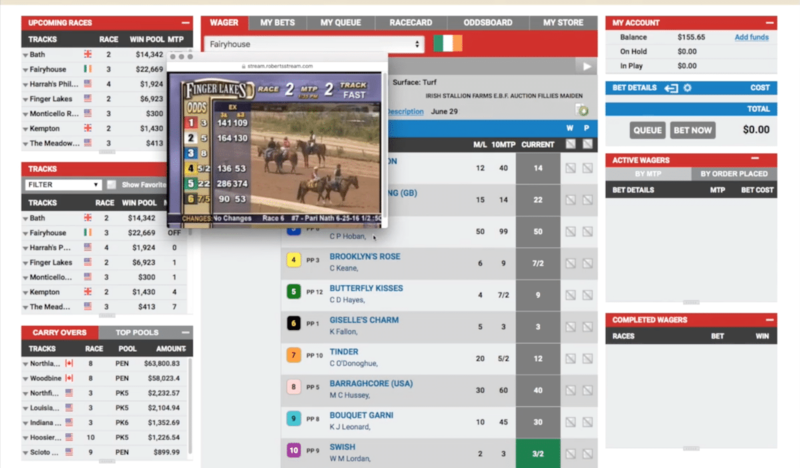 Selecting a track from any menu opens the bet pad with a list of the day’s races, the horses expected to run in each race and all betting options. 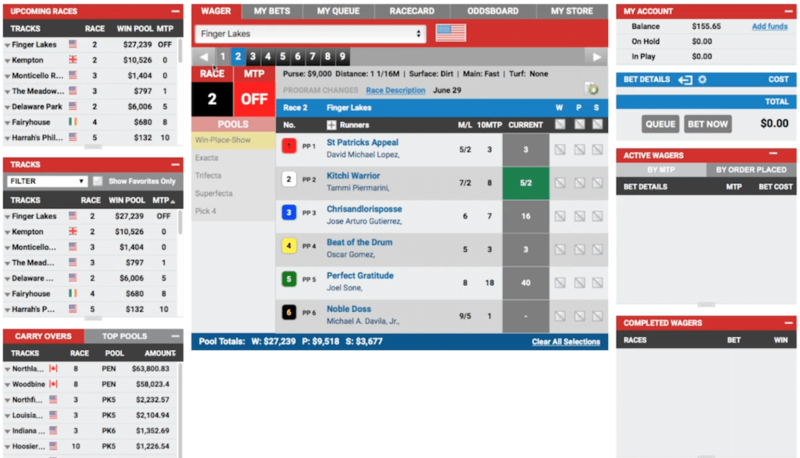 The bet pad is where you’ll spend the majority of your time as Interbets as it is full of information including horse and jockey information, race length, purse, pool totals, wagering options and minutes to post. You can cycle through the various races by selecting among the numbers at the top of the bet pad. As a US-based and licensed betting site, Interbets.com is required to have agreements with every track on which it accepts wagers. To date, Interbets has deals in place with most major racetracks in the United States as well as tracks in Canada and abroad. All racing pools are commingled with local tracks, which means you are paid at true track odds on all winning wagers. All the same bets that you would be able to place in person are available at the Interbets website and all are easy to place. The upgraded betting interface makes it easy to switch between win-place bets and the various exotics, as well as key and box your bets. All you need to do is choose your horse, select the type of bet you wish to place and then choose an amount to wager. All odds are kept up to date at all times so you’ll always know how much you stand to win. Interbets is the firste site we have reviewed to date that supports the 123racing Pick6 wager. This wager allows you to compete against handicappers around the world in a new take on the old Pick6 bet. In the 123racing wager, you make a Pick6 bet like normal as you attempt to predict the winner of every race. What makes the 123racing wager different is your picks also earn points based on their win, place and show results as if you had placed a $2 wager on each horse. For example, if you pick a horse that takes second place, you’ll earn points for that horse based on the place and show payouts. Let’s say in Race 3, you choose horse number 1 and he ended up finishing in second place. In that case, you would earn a sum of points equal to the $2 payout on place and show bets. That would work out to 6.40 points in this race based on the above payouts. After you make your picks and create a nickname, you can then watch for your name on the national leaderboard that is displayed on-screen at tracks, on betting terminals and online. If you earn more points than your peers, you earn the top payout for that day’s total jackpot. One other thing that makes the 123racing wager different is you can have horses that miss and still win. The national jackpot is based on total points earned, not necessarily on racing results. It will obviously help you to get every pick right, but you can still win the jackpot if your other horses earn enough points to beat the competition. Interbets.com also accepts telephone betting, but the New York surcharge (5-6%) applies unless you have a “no surcharge” account with at least $300 in it. You can contact Interbets for more information about having your wagering account upgraded to no surcharge if you plan on submitting bets via phone frequently. You may also place mobile bets with the official Interbets mobile app. The mobile app is available for Android here and iOS here. Live streaming video is supported as well. 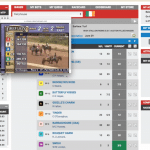 In fact, Interbets has one of the strongest live streaming products on the market with support for up to 3 video screens that allow you to watch multiple races simultaneously, all in real time. Interbets hosts a surprisingly diverse array of contests and promotions despite being a fairly niche site focused primarily on the New York market. New customers are often greeted with welcome bonuses while existing customers can take advantage of cashback rewards, free and paid handicapping contests, random giveaways and more. New customer bonuses at Interbets are released sporadically and you’ll need to keep your eyes open to spot them. This is not like most horse racing sites that offer bonuses all year long; the Interbets bonus is only offered at various times throughout the year with a unique bonus code. If you’re interested in claiming the bonus, you might just want to sign up for the Interbets newsletter and keep an eye on your e-mail inbox for the next bonus. The Interbets cashback program kicks in whenever you wager $2,000 or more in any single month. For every $1 you wager, you’ll earn 1 Rewards Point. Once you reach 2,000 Rewards Points, Interbets will give you a cashback reward for that month. The more points you earn each month, the higher your cashback percentage. The variety in promotions is nice, but I did find it a bit off-putting that they do not clearly explain all promotions on the website. It seems that Interbets is a little disorganized in this manner. Rather than scheduling promotions in advance and explaining them on the website, they release new promos randomly. At the time of this review, Interbets was offering up to $100 for all new customers. Use the promo code GEO100 to claim this bonus when you sign up for an account. I sent an e-mail to customer service recently in order to clarify the list of states from which Interbets accepts customers. Someone from customer support responded to me exactly five minutes later with a personal answer to my question. The answer I got wasn’t what I was hoping for (more on that below), but I was impressed with the quickness of their replies throughout our e-mail exchange. Whoever I spoke to was professional, courteous and prompt. I couldn’t ask for more from any company’s customer service department. Interbets makes it clear that the site is designed primarily for players from New York State. You can see this in the promotions they frequently run in conjunction with local tracks / OTB facilities and in references made throughout the site. However, Interbets does accept customers from other states. The frustrating thing is Interbets does not make it clear which other states are accepted. A customer support representative told me they only accept customers from states that allow online racing betting and in which they have agreements with local racetracks. I asked for clarification and they explained their accepted states changes from time to time, so they do not maintain one list of accepted / restricted states anywhere. It’s a bit annoying, but I think if you’re not from New York, there are better options in BetAmerica or TwinSpires. If you do live in New York, Interbets is a solid option. The interface is nice, they have a lot of local connections and they run frequent promotions.